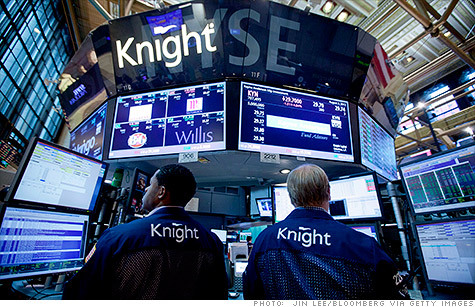 Knight Capital signed a $400 million deal to cover most of its losses from a trading glitch. NEW YORK (CNNMoney) -- Knight Capital Group will live to see another trading day, but its investors are not pleased. After suffering a massive loss from a trading glitch last week, Knight Capital (KCG) struck a deal with a group of investors who purchased a majority stake in the trading firm for $400 million. Knight Capital's stock dropped more than 24% Monday to close at $3.07 following the announcement of the deal. The new investment will severely cut into the value of existing shareholders' stakes. Knight said the group of new investors includes TD Ameritrade (AMTD), Blackstone Group (BX), Getco, Stifel Nicolaus (SF), Jefferies Group (JEF) and Stephens Inc. These investors will receive 267 million shares of Knight, according to a document filed with the Securities and Exchange Commission on Monday. Ahead of this deal, Knight had roughly 90 million shares outstanding. Knight lost about 60% of its value over a three-day period last week, despite a huge rally on Friday. "I feel very confident and the board feels confident we made the right choice for this firm," CEO Thomas Joyce told CNBC Monday morning. The firm lost $440 million after a trading software snafu on Aug. 1 that sent numerous erroneous orders in NYSE-listed securities into the market. Some 150 companies listed on the NYSE were affected. Knight Capital plays a key role on Wall Street by acting as a middleman in the markets, completing investors' orders to buy and sell stocks. Last week, several clients of Knight suspended trading activity with the firm. But by Friday afternoon, several of those clients, including TD Ameritrade and Scottrade, had resumed trading with Knight. That helped lift shares of Knight by nearly 60% on Friday. On Monday morning, E*Trade (ETFC) said it had also resumed trading with Knight. Still Roger Freeman, an analyst at Barclays Capital that follows Knight, said he still questions just how much of the firm's overall trading volume will return. The New York Stock Exchange (NYX) also announced Monday morning that it temporarily reassigned custodial duties over nearly 700 stocks to Getco, another high speed trading firm. Once the rescue deal is officially completed and approved, the New York Stock Exchange said it will hand these stocks back to Knight.